In this quarter, we published new maintenance releases of all our control products and released the 2016.1 WinForms Controls. In terms of development, we've been working on a new Grids product (for WPF and UWP) that will initially consist of a TreeListBox, similar to the tree control found in the Visual Studio Solution Explorer. That control is already in alpha testing to some customers. While that testing is ongoing, we have made great progress on a TreeListView control, which is a multi-column variant of the TreeListBox control. This control features everything you find in a standard ListView, along with all the features of TreeListBox, and additional ones like column reordering, frozen columns, etc. We'll post more on this new control very soon. Development of the TreeListView control is currently the primary focus. We hope to wrap that up for alpha testing in the next two or three weeks. After that we have some other plans for derived controls that are based on the foundation provided by TreeListBox and TreeListView that we will be getting into. In the last blog post on our TreeListBox control development, we talked about new features like async loading and inline editing that were added. In today's post, we'll talk about some more new features and we're also announcing that the alpha test of this control is now ready. If you would like to start working with the control and provide us with feedback, please write our support address or chat with us on Slack to sign up for testing. Now is the time to contribute your additional feature ideas and report bugs. 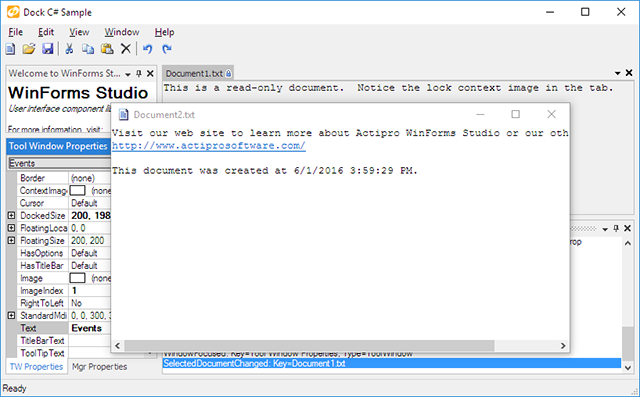 Anyone who has a WPF Studio license is fully licensed to use the control in their apps. Since our new post, we've continued to enhance the control and add new features. First, you now can optionally display the root item in the control. When you choose not to do so (the default), the root node's children will be the top-level items. There is now more control over expandability and when children are queried. A robust drag and drop system supports dragging to external controls, dragging and dropping on the same control, and dropping from external controls. You have full control over the visual feedback that is provided and what happens when a drop executes. The control supports data virtualization when virtualized lists of child items are used. With data virtualization, it's possible to support paged retrieval of items as they are requested for display. A couple new options determine how far items are indented based on their depth. Optionally show the root item in the control. Fine-grained control over expandability and children query triggers. Optional async loading with busy indicator display. Inline editing via F2 and single-click on a selected item. Per-item context menus that can be constructed dynamically via an event. Drag items to external controls, drop data from external controls, or drag/drop items within the control itself. Dragged items can highlight above, on, and below drop areas for each item. Single and multiple item dragging is supported. Optional data virtualization optimization when using virtualized collections. Indentation of top-level and other nodes can be set independently. The TreeListBox control is now ready for alpha testing. Please contact us via our ticket system or in Slack to sign up for testing and send in your feedback. We will continue to refine the API based on your feedback before a future final release. Maintenance releases of our v2016.1 WPF, Universal Windows, and Silverlight controls have been released and are now available for download. Docking/MDI for WPF and UWP has several new options that give you more control over UI appearance. Tab text on tabbed MDI tabs will now trim long text with ellipses in the middle, instead of the end, allowing for filenames to be more readable. SyntaxEditor's completion and parameter info providers in all language add-ons now allow you to intercept OnSessionOpening, even when no items were pre-populated, so that you can add your own custom items/info. Cut, copy, paste, drag, and drop all now support the block and full line flags that are compatible with Visual Studio. The Python Language Add-on added a text range property to all type and function definitions, allowing you to implement features like go to definition easier. The Shared Library added a new RingSpinner control that is an animated ring where the two ring segment ends chase each other around the circle. It's great for display while performing a lengthy operation. In the last blog post on our TreeListBox control development, we gave a list of features that have been implemented so far and showed a screenshot of sample usage with rendering customization. In today's post, we'll show some more usage scenarios, will request your immediate input for drag/drop, and will give an updated feature list. First, what's new since the last post? We now have multiple options for governing if and when the determination of expander display is made for a node. This is handy when you want to do minimal data model access checking for children, or when you know for certain that a node never has child nodes. We now support optional async loading features where you'll be able to utilize a new RingSpinner control (or any other busy indicator) to relay a loading state to the end user. Async loading means that potentially lengthy operations such as file or database access won't block the UI thread when expanding a node. Notice how the UI remains fully responsive even while loading items. Inline editing is fully supported when enabled. Press F2 or single click on a node's content to enter edit mode where a new text value can be entered. Pressing Enter or losing focus commits the value, while pressing Esc cancels the edit. An event will fire when an item requests a context menu. Dynamically create the menu for that particular item (or the entire multi-item selection). Drag and drop is one of the last features we want to get in place before an alpha test version is prepared of the control. This is a complex topic since it involves single/multi-selected items (that could be at various tree depths) being dragged and dropped at other depths, or even dragged externally. Likewise, external items could be dragged onto the control. We want to get your feedback now as we start on drag/drop features to ensure we meet all your needs! Please either write our support address with your feedback or join our Slack discussion on the topic and chat right with us. The benefit of the chat option is that we are posting screenshots and asking for feature input right during development. It gives you an opportunity to give direct feedback and help guide features. Multiple display modes for node expanders. The TreeListBox control continues to progress well and its feature set is coming right in line with the VS Solution Explorer's tree control's feature set. We look forward to discussing drag/drop feature requirements with you via our ticket system or in Slack!